is an ideal driving component for wheel or track driving vehicles, and other moving equipment. Drived by fired or variable, or in-built short hydraulic motors, in multiplante-disk planetary driving method, the structure is quite compact, especially suits those space-critical equipment. 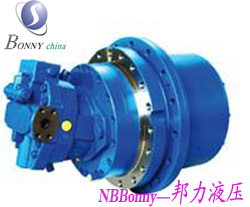 In addition, the torque range covers from 7kN. M to 80kN. M, thus mainly applicable in construction engineers such as excavators, pavers, drilling machines, tunnel machines, etc. The port is made in compliance with international regulation. 8. Ease of maintenance, especially suitable in foel ambient like mine, sea, tunnel, etc.